Designed to properly locate and center the front axle under the body of your Cherokee/Grand Cherokee, the adjustable track bar will improve handling capabilities and improve your Jeeps steering geometry. This kit is specifically designed to correct misalignment that can develop with Jeeps with 4-6” of suspension lift. Our track bar tubes are constructed of beefy 1.25”OD Tubing with a .25” wall thickness to tackle the toughest off road conditions. All adjustable Track Bars are powder coat painted to prevent corrosion and include polyurethane bushings, heavy duty mounting brackets and a tough 7/8” zinc plated tie rod end. 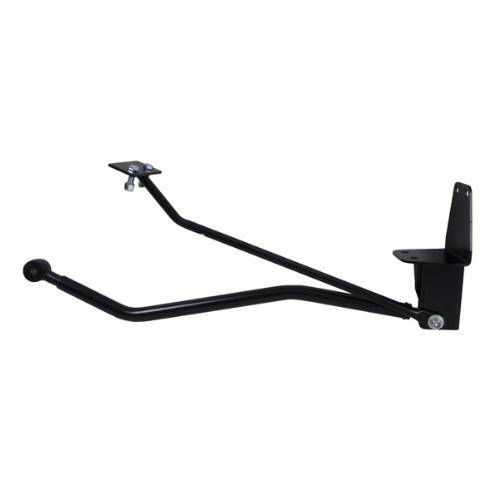 For added front end rigidity, the Rugged Ridge Frame stiffener is included. This piece ties the front frame rails together while bracing the track bar mount.